Welcome to our RiverBum Pro Page. Our pros are some of the best folks you’ll find in the industry. They are fantastic and successful guides in their own right that can put you on fish from Big Brown Trout in Montana to Shark in Tampa to Musky in Maine, to Apache trout in Arizona. 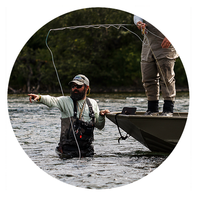 All of our pros are passionate fly fishers, conservationists, and teachers. They contribute immensely to their local waters and to RiverBum. They test our products, give feedback, and help improve our overall business offering so you the customer are confident that you get tried and true products. Jim Mitchell along with his wife Bonnie operate Montana Hunting Fishing Adventures in Hamilton, MT. Jim is the Exclusive Outfitter for the Bitterroot Fly Company in Darby, MT. Jim began guiding in 2001 and became a fishing Outfitter in 2008 and added hunting in 2010. Jim is a Premier RiverBum endorsed fly fishing guide and Tenkara guide certified by Daniel Galhardo, owner of Tenkara USA. Jim was born, raised and still lives in the Bitterroot Valley of Western Montana near Hamilton, MT. Book a trip to beautiful Montana with Jim! Allison grew up in Northern Idaho. Her father, a travelling musician, was an avid fly fisherman, teaching Allison all he knew…while travelling the country. She has fished it all from the Yellowstone, to the Olympic Peninsula, to the ditches in Houston, and now The Florida Keys are her home waters. Allison is a fantastic guide skilled in stalking and presenting to skittish fish on the flats. She is also a featured author, published in Dun Magazine and The Outpost Life Magazine where you can read her articles and see her photoshoots. When not on the water, she is busy helping RiverBum develop its saltwater offering. 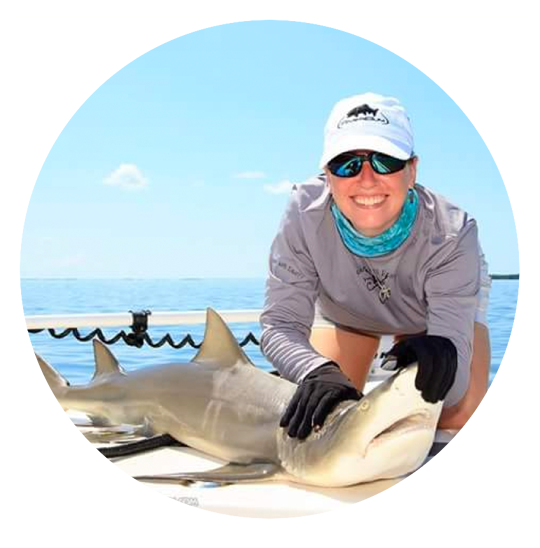 Allison has helped design the new RiverBum saltwater division apparel, innovative new fly patterns, and is very active on social media. Allison contributes to our newsletters, blogs, and a myriad of product information and feedback. She is a wonderful casting instructor as well as a field tester for Monic and Cortland Lines. Jimmy grew up in Destin, Florida, where he fell in love with the water, boats, fish and fishing … not necessarily in that order. The family moved to North Carolina where he honed his skills on the banks of the New River near the town of Todd. By 13, he was learning to cast dry flies to brookies and ’bows in the local tributaries. Later, during high school, the family moved back to Florida where he chased largemouth bass on Lake Seminole. 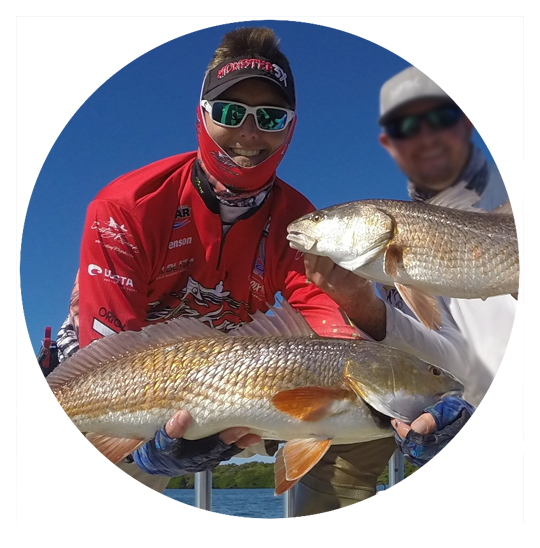 After high school graduation, Jimmy moved on to Pensacola to sell boats while he learned all about fly-fishing for bull redfish, trout and snapper on a fly. He subsequently worked in a local fly shop. Wanting to pursue his passion he's been a USCG captain three years now, and works Lees Ferry section of the Colorado River. He's learned much from Wendy and Terry Gunn. He's been using RiverBum flies since the day he started there and loves them and the many clients he gets to help catch fish with them. Cinda has been guiding in Arizona for several years. She’s spent her whole life fishing and picked up a fly rod in 1996. She worked for the Orvis Company as the only female Fly Fishing Manager for eight years before branching off and starting her own business in 2012. She spends a considerable amount of time instructing people on the sport of fly fishing. 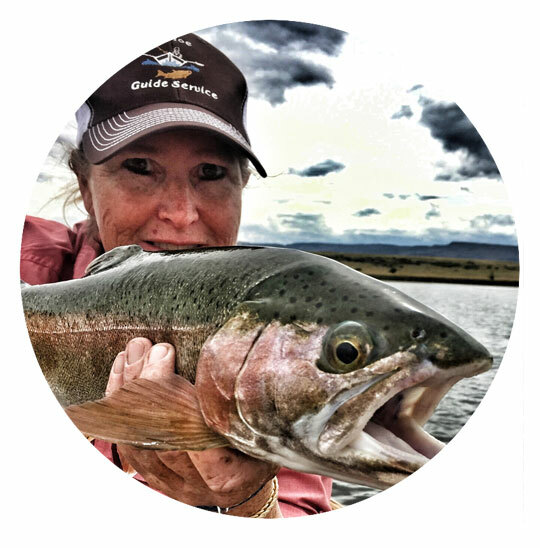 Cinda has been featured in several fly fishing articles and books (“Fly Fisher’s Guide to Arizona” by Will Jordan, “Arizona’s Official Fishing Guide” by Arizona Highways and Arizona Game and Fish Department) as an expert on fly fishing in Arizona. 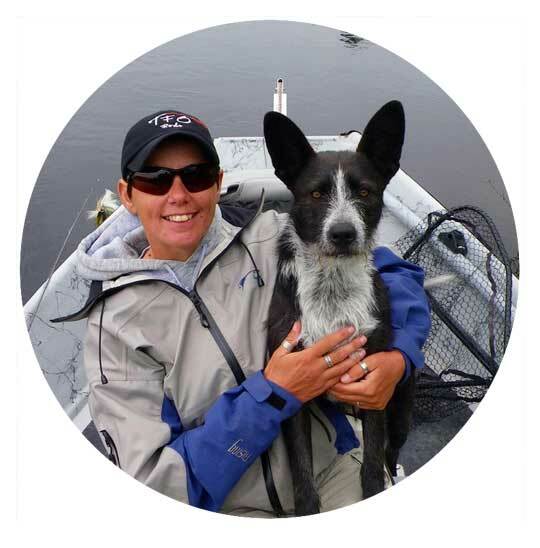 She is extremely passionate not only about fly fishing but also about teaching others. She hosts trips all across the world and has taken customers fly fishing in Alaska, Belize, Oregon, Montana, Colorado, New Mexico, Utah and The Bahamas. Cinda loves to fish for trout, steelhead, pike, carp, bonefish, tarpon and anything else that will eat a fly. She is a past President of Desert Fly Casters and is a Zane Grey Trout Unlimited board member. If you’d like to book a Guide Trip or scheduled a Casting Lesson please contact us today. See the best fly fishing Arizona has to offer. Spending his summers at his grandparents’ house on the pan-handle of Florida, Greg’s first experience with a fly rod was casting poppers to pan fish, but quickly moved to largemouth bass and various saltwater species. At the age of 22 when he moved to Colorado, he realized his passion for fly fishing for various species of trout. Since then, this passion has grown and now he loves to target any species that swims and has scales; scales being optional. 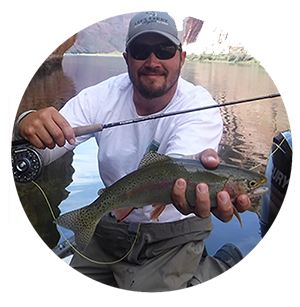 With a passion for travel, adventure and fly fishing, Greg has traveled to and fished many exotic locations. He has enjoyed angling in over 13 countries targeting many different species with a fly rod. The list includes Botswana (where he lived for approx. 2 years) for Tiger fish, Mozambique for King Fish, and Chilean Patagonia for monster Brown and Rainbow Trout among many others. The list of countries continues to grow. ​Greg has spread his love of adventure and travel to encompass Alaska where he spends the summer months guiding the Bristol Bay Region for everything from Trophy Rainbow trout to Dolly Varden to Sockeye and Silver Salmon etc. During the off season the Chattahoochee Tailwater and North Georgia waters are where he spends his days guiding. Both waters offer a very unique​e fishing experience and should not be missed. ​​​“More than anything, I enjoy sharing the outdoor experience and helping beginner and intermediate anglers, along with young people, experience fly fishing. It is an incredible feeling to help people have a great day on the river! I love my home waters of the Chattahoochee and miss it immensely when not on it.” If not guiding, you more than likely can find him either planning out his next adventure. 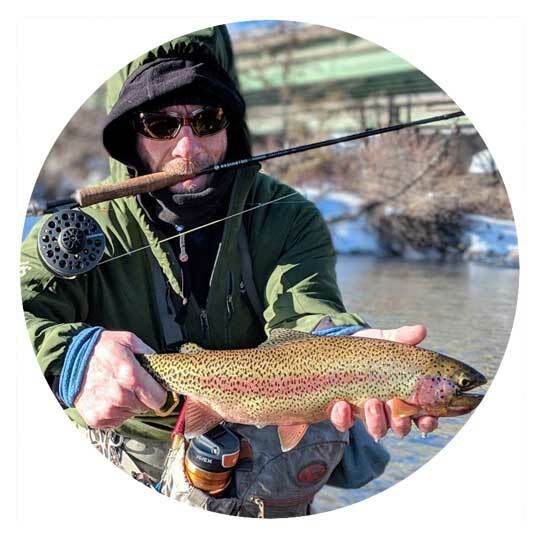 Michael Hunt is a professional New York state fishing Guide (license#6713) with 24 years of experience on the Salmon River. You’re always in great hands when you are with Mike. He is certified in first aid, CPR, AED, water safety, and small craft. He specializes in fly fishing, centerpin, and noodle rods for steelhead and brown trout. He is also a certified custom rod builder, constructing rods for every application. In addition to being a RiverBum pro, he is also a pro staff member for Sage, Redington and RIO. He is also an active member of NYSOGA (New York state outdoors guides association). I’m a bit of a gypsy at heart who has recently married and settled down on the Coast of Maine. I grew up on the East Coast and spent most of my young adult years in the White Mountains of NH.I’ve guided in New Hampshire for trout and moved my business to the Midwest to guide for musky in the UP of Michigan and Trout in the Driftless area of Wisconsin. Will Ricks is a Wildlife Biologist in Raleigh, North Carolina. He did his undergraduate work at NC State and went to graduate school at the University of Georgia. He is a full time Wildlife Biologist and has a background in game and non game species and land management. Ben Ricks operates Ricks Brothers Outdoors out of New Bern, North Carolina. With over 30 years of fishing experience from Alaska to Brazil, Ben has seen and done a lot. Ben chose to hone his skills and focus on inshore/nearshore fishing over 12 years ago. His love of fishing and teaching people how to fish falls just slightly behind his faith and his wife Heidi “The Redfish Queen”. When Ben is not fishing he is busy helping on the family farm where they manage for wildlife focusing on deer and turkey. They also manage a pond for trophy bass and sunfish on the farm. Chris was born and raised in Colorado, in the heart of trout country, currently residing in Boulder County. He threw bait and lures as a kid and it wasn't until he was about 13 or so until he picked up a fly rod. He dabbled in it for about a year or so. He caught his first and only fish on the fly, as a kid, in Yellowstone National Park. 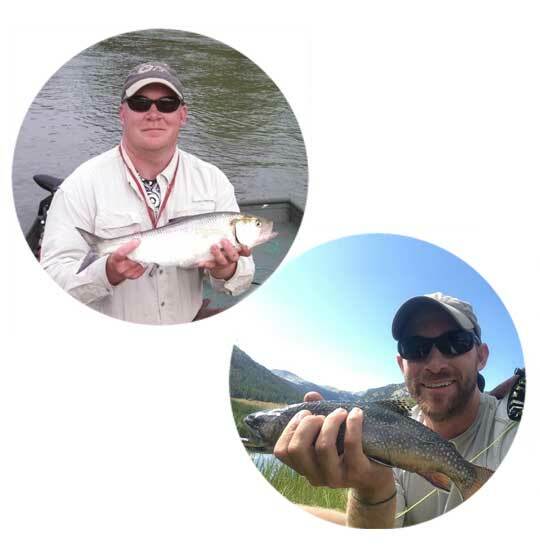 Chris credits his father for not only fishing all those years in Colorado, but opening his eyes to fly fishing. Chris has become a very proficient tyer, concentrating on guide patterns, stage symbolic patterns, and unique fine crafted patterns. Although he does not currently guide full time he still takes some trips and hopes to guide full time, year round, when his son heads to college in 4 years. He knows it's the best job ever and would love to travel the world making a living doing the thing he loves most….fly fishing. 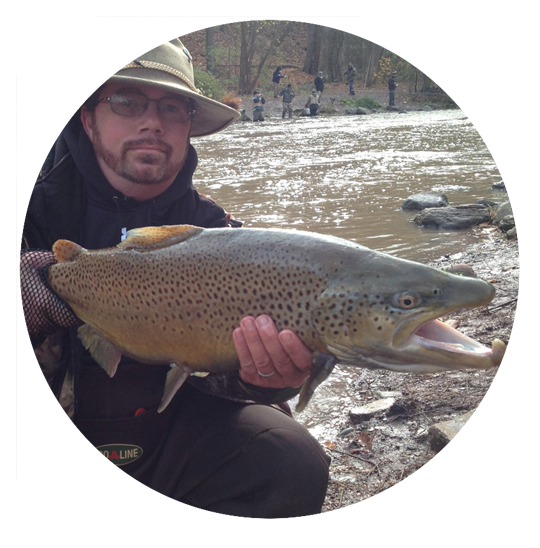 Chris is passionate about fly fishing and fly tying, and teaching the art of both. In addition to fly tying classes, he also helps run the fly fishing clinics at RMA fly shop. 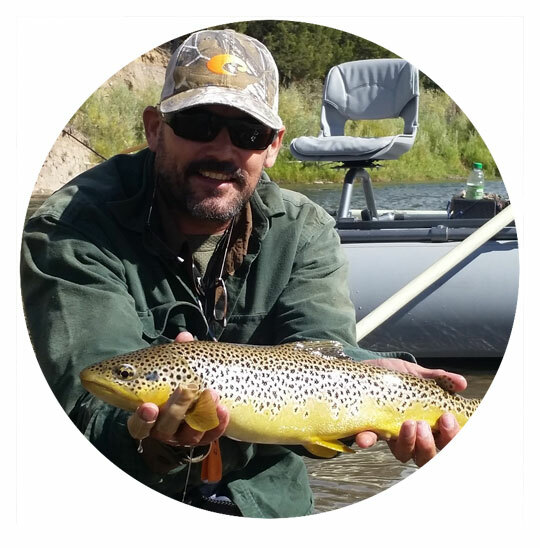 He enjoys nothing more than spending weekends fishing with his son and catching trout of any sort, especially Colorado native Greenback Cutthroat. To book a trip with Chris Hull, contact him at (303) 523-3136 or call Rocky Mountain Anglers direct at (303) 447-2400 and request your trip be with Chris. 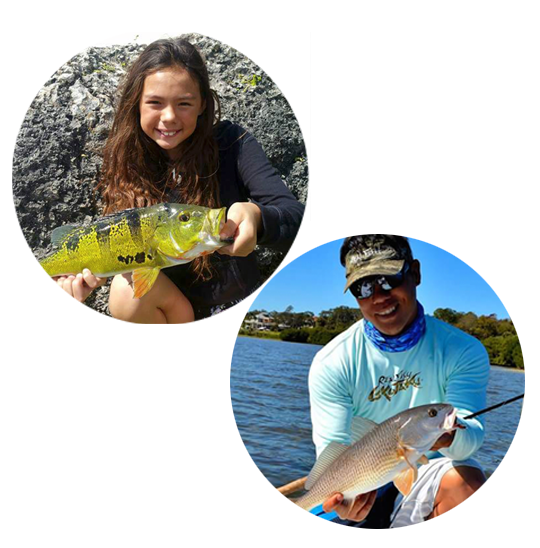 Owner of Casting Kayaks LLC, Eric Henson has over 30 years fly fishing experience and frequents the waters of Tampa Bay down to Charlotte Harbor in Florida. His favorite targets are redfish, snook, trout and tarpon. "As a kid I was lucky enough to grow up on a lake, next to a Pro Bass fisherman. Learning how to use baitcasters, spinning reels, and fly reels at a very young age, my passion for fishing grew very early on. I’ve had canoes, kayaks, and boats my whole life which has kept my heart near the water my whole life. Now, I am married to an amazingly beautiful wife named Rebecca. My children are a French Bulldog (Dozer), Red/Blue Nose Pitbull (Chloe) and a cat that I happened to inherit when I got married. "My wife has her own private practice as a dietitian. I on the other hand was a Chef at the Ritz-Carlton for 11 years. We are both 'foodies' and needless to say we come up with some really delicious healthy recipes! Now I am a full-time Professional Kayak Guide and a Professional Kayak Tournament Angler. In my spare time, I enjoy writing articles and do videos for many magazines and fishing companies. God, Family time,Tournament fishing, and Guiding are some of my biggest passions. October 18th 2015, I was lucky enough to take 1st Place in the Kayak fishing Classics National Championships and brought home the Series Champion/ Angler of the Year Award." Tina grew up all over the state of Wisconsin. Her family moved around a lot and little did she know she was able to fish some premium waters in different regions of the state. Tina joined the US Army in 1977 and is a US Veteran. She raised a family and became a high school teacher for At-Risk teenagers. While teaching she began a program called Project Green Teen at Shabazz High School in Madison, WI. Students take a semester of Science and then learn how to fly fish, spending a week in the Driftless area of WI. She was asked by her TU chapter to create a clinic for women interested in Fly Fishing. She began the Wisconsin Women’s Fly Fishing Clinics. The by women, for women, Beginners Clinic became wildly successful and lead to developing an Intermediate, On the Water Skills clinic, where women work on their skills while fishing with guides. Additionally, a Riverbuddy Training clinic was created to teaching women how to mentor other women on the water. These clinics are so successful they fill every year and have a waitlist and women flying in from other states to participate. Tina recently retired from 25 years of teaching and began ShenanigansFlyFishing, LLC. ShenanigansFlyFishing works with men and women while specializing in opportunities for women to have outdoor endeavors in a safe manner allowing them to expand their comfort zones. 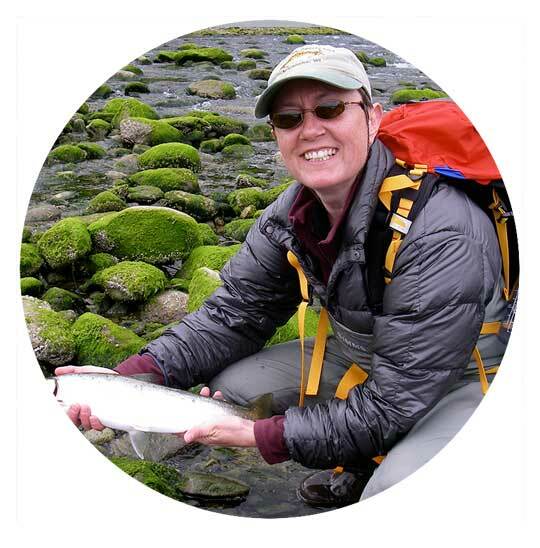 Tina is committed to sharing the sport of fly fishing to populations that have less access and through means that are unconventional to current methodologies. As an organizer and collaborator she believes anything is possible and by finding other like minded people great things can happen. Hi my name is Tony Lai I've lived on the West Coast of Florida for almost all my life. The Florida's lifestyle is either the beach or just being on the water! Luckily fishing choose me. I’ve been competitive my whole life playing sports, and now I competitive fish as many fishing tournaments I can fit in my schedule and have done very well I believe. I picked up the fly rod to keep things fresh and interesting. Then fell in love with the sport soon after chasing everything to catch with the bug whip for the first time. I would have to say it was like being a reborn fishermen again, it really re-energized my passion for the sport. I have two children, a daughter and son, that both love to get a line wet too. I try to teach them the love for nature and how to preserve by conservation and by having respect of the land so others can enjoy it too. I'm also the guy that will jump in his truck to chase the next bite or just a road trip to fish for whatever is biting or maybe a new species on the bucket list!